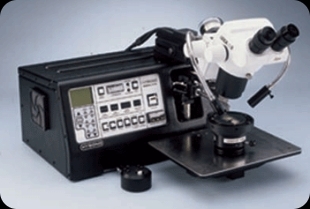 Model 676 is a Deep Access, Long Reach Thermosonic Wedge Bonder for wire diameters from 0.5 to 3.0 mil (12 to 76µm) and ribbon up to 1.0 x 12.0 mil (25 x 300µm) featuring Hybond's unique Soft Touch energy system. The 676 was specifically designed for applications that require bonding at extreme height differences between 1st and 2nd bond and bonding wires to sensitive devices such as gallium arsenide FET's and LED's. Model 676's motorized wire feed and wire/ribbon clamping system provide superior wire/ribbon control and also allow the operator to increase or decrease tail length in 1 mil (25µm) increments at a touch of a switch. The amount of clamp "pull-back" required to break the wire at final bond may also be varied in relation to wire elasticity allowing the use of softer wires (higher elongation) than conventionally used in wedge bonding. 676 shows actual units for set up of bond parameters.